Sanora Babb’s fictionalized memoir of childhood hunger and survival is rooted in the earth, yet sings with sentences that soar. The 1930s Dust Bowl era of America is known in large part through the fictional works of author John Steinbeck. 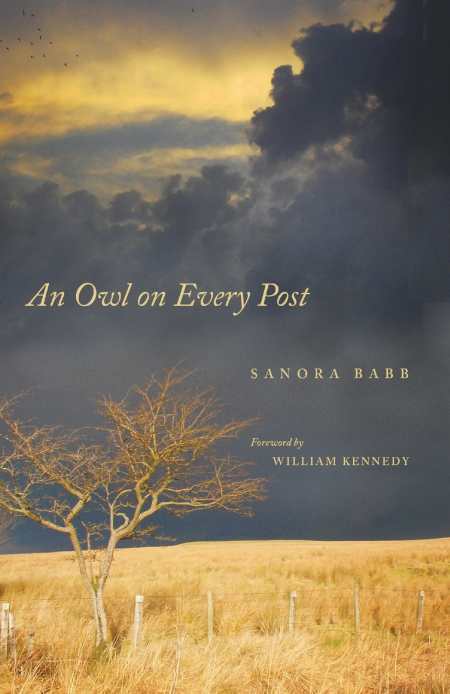 Sanora Babb’s novelized memoir An Owl on Every Post makes its own, equally striking mark—depicting hardships of an earlier era, during her childhood in the 1910s, when she lived on the high plains of eastern Colorado. Babb’s father uprooted the family when the author was just a young girl, eventually joining his own father to seek life as a farmer. But reality proved much bleaker than expected, and the ensuing tale of extreme hunger and survival is harrowing. Babb later became a highly regarded writer, and this account, though at least somewhat fictionalized (her sister Dorothy is called Marcy in the book, and an extended sighting of a “ghost horse” casts a measure of doubt to its complete veracity), certainly proves riveting, with dangers such as rattlesnakes at every turn, and a strange, possibly dangerous neighbor named Old Loony, to boot. A “fictionalized memoir” may seem like a red flag, but most of An Owl on Every Post squares up with Babb’s life exactly, down to her Indian name, “Little Cheyenne Who Rides Like the Wind,” bestowed by a chief who took a shine to her; an afterword by the author provides additional overview and clarifications. Elements of the book evoke Harper Lee (the mysterious Old Loony in Owl is reminiscent of Boo Radley in To Kill a Mockingbird), John Steinbeck (Babb’s own novel Whose Names Are Unknown, detailing the Dust Bowl years, has been favorably compared to The Grapes of Wrath), and Laura Ingalls Wilder. The book delivers a harsh and unforgiving situation, viewed through the eyes of a little girl, communicated with the sure hand of a skilled writer. An Owl on Every Post would make an engrossing read for most audiences. Muse Ink Press has done the literary world a service in republishing the book, with a new foreword by Pulitzer Prize-winning author William Kennedy; the wonder is that it ever fell out of print in the first place.